A 6mm I Ain't Been Shot Mum game played at Gigabites Café, Marietta January 2016. I wanted a fairly small late war, East Front game so went with this skirmish from the Knight Gunner book. 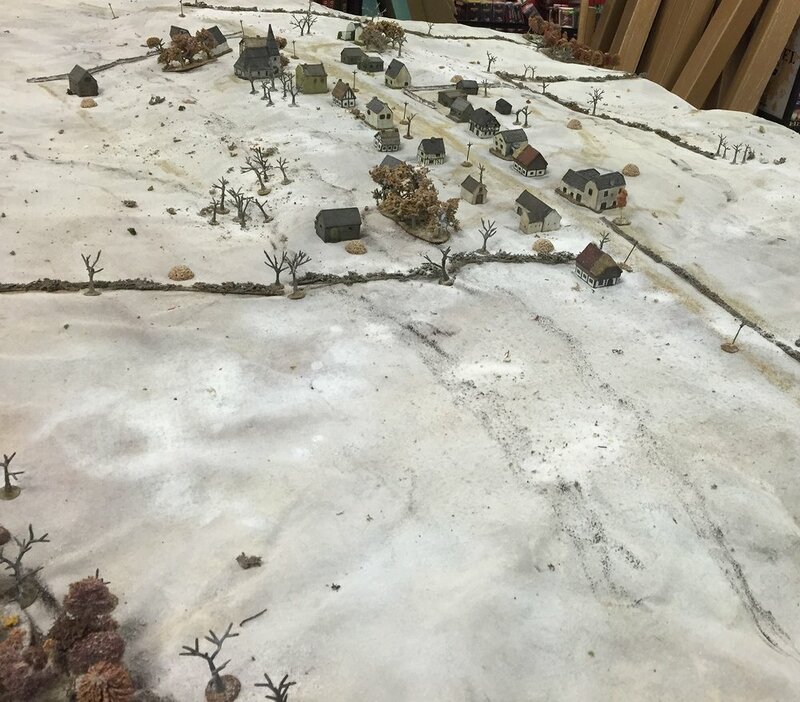 The scenario takes place Feb 3, 1945. Fallschirmjaegers are trying to retake a series of villages with the aid of 276 StuG Abt. This road leads off to Sauermuhl and Katsau, occupied by more Russians off board. The Germans had to retake Belino and then have enough strength left to retake Katsau. Mark G, Brian S and I were the German players. Mark G had a weak four-section company (two platoons of two sections each) of Fallschirmjaegers from II Fallschirmjaeger FlaK Abteilung, two MMG sections, along with a Quad 20mm halftrack. Brian had a stronger unit from that unit (three platoons of two sections each) and an MMG section. I was the Stug support of three StuG IIIGs and two Jagdpanzer IV L70As. We also had a pregame stonk. Belino is along a slight ridge with woods to the left side here and a creek parallel across the front to the right. Mark G started his units from the woods on the left here. Brian and I came in from the left front. William T. had a company from the 291st Rifle Regiment consisting of three platoons of two sections each, three MMG sections, three 45mm ATGs (horse drawn transport) and three SU 100. No time for entrenchments. Our pregame stonk landed mostly on the back side of the village and didn't do much damage. William is moving his troops up to the first line of buildings. He misheard the info that the Germans were on this side of the board. It's a pity our initial moves weren't faster. They are taking fire from one of the MMGs. I did manage to paint up some winter troops, but only had enough for half the force, so these are not in their white jackets. 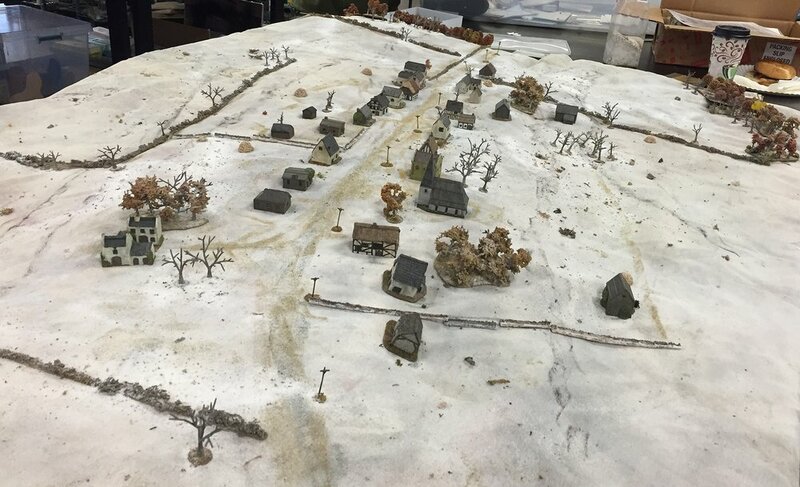 Some recently painted up winter troops from Adler try to make the shelter of Belino before the Russkies can open up. One of the SU100s opens up with its MG. One of the three Stugs spots an MMG near a wooden building and causes it to vacate its position to the rear. One of his platoons, along with Su100's MGs, scatter the assaulting Fallschirmjaegers. Meanwhile another platoon of Brian's paras works its way into the village from the right. Two of the Stugs cautiously advance up the slope. Three Su100 spotted now, but the lay of the land makes it hard to get a shot at them. With the help of the Quad 20mm halftrack, he was able to advance into the first few buildings with few casualties. One 45mm ATG has been overrun and a couple of sections of Red infantry forced back. 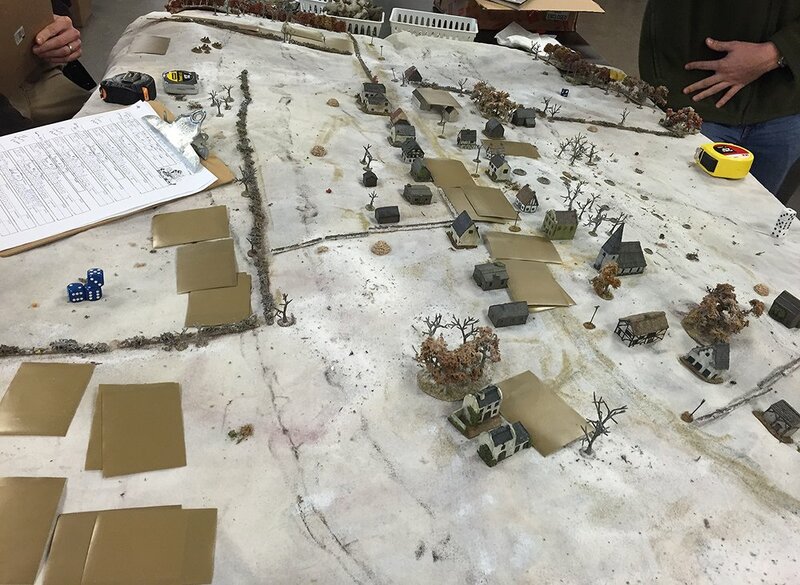 One of the German MMGs has moved up to cover their left flank and the other is now moving up from their initial position back at the start line. 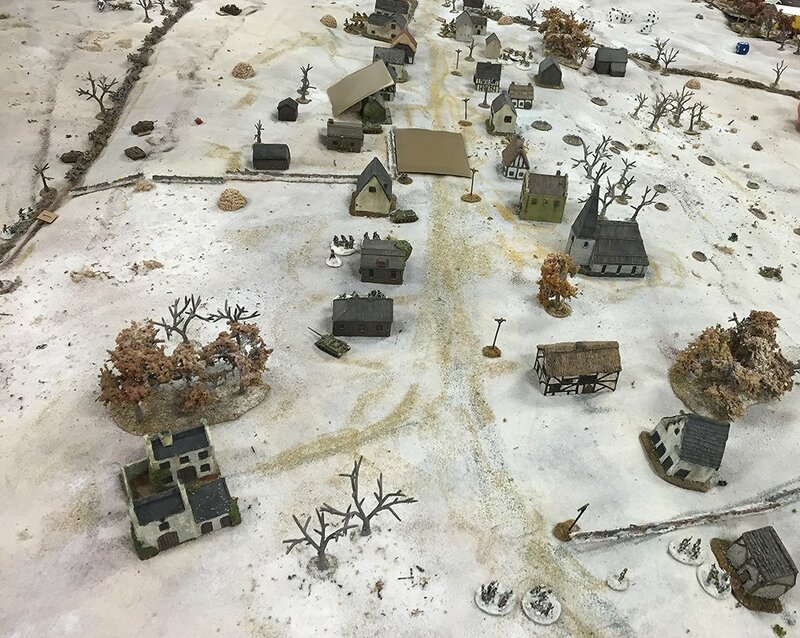 The Sdkfz quad 20 moved up to engage the front of the village and comes under fire from another 45mm ATG It had already taken some damage from the now abandoned gun at the bottom of the picture. Su100 and an MMG and ? GHQ models painted up the week before the game (I can't believe my SUs had disappeared). I-94 decals on their sides btw. There is another weak infantry platoon under these Blinds. They lost the shoot out. 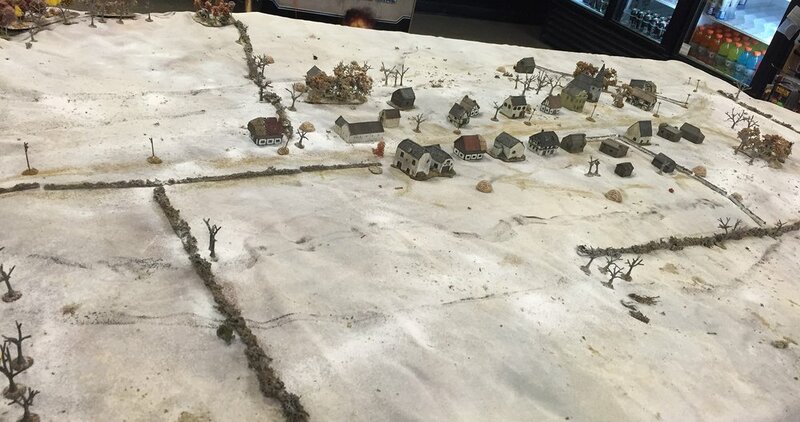 Historically the Germans lost no armor in this engagement. I don't think we'll be going much further today. Really nice models from GHQ. I had some very slow movement up to this point with these vehicles. Also painted up just for this game. Nice flank shot does one Su100 in. Su100 move quickly to the flank. My other jagdpanzer couldn't get into position quick enough to cover the flank of the vehicle that was waiting to blast incoming Soviet reinforcements. Coming from offboard. We had rolled ahead of time to see if the Fallschirmjaegers had some fausts and a real crap roll came up with "No". Fortunately the Russians don't know that. But not able to advance further. So this makes for a Soviet victory. Casualties for the Russkies were: two platoons gone (only 7 men left between the two platoons), and the 3rd platoon lost four men. All three MMGs wiped out. Two 45mm ATGs gone and the third hitched and running. One Su100 gone. The Russians assumed that we had panzerfausts so were keen to vacate the village with their armor. The T34s were afraid to move in. Germans lost: in Brian's company, about half the men altogether went down. 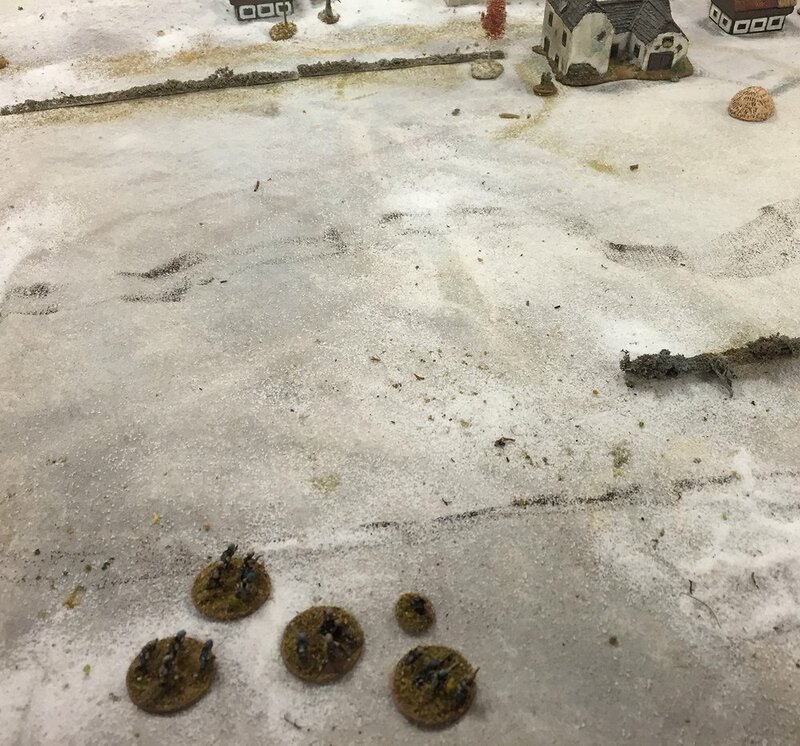 Mark G lost ten men and the halftrack. However, I lost two Stugs and one Jagdpanzer IV which ended our little offensive.